A surveyor’s most important deliverable emerges from detailed analysis and quality control. Recently, my four-year-old son grabbed my tape measure and began taking measurements of our living room. I asked if he wanted to be a surveyor like his dad, and he confirmed with a smile on his face. I played a small joke on him by asking whether he had calibrated his tape and what was the standard deviation for the room width. Although the question was perplexing to my son, the situation highlights an essential difference between surveyors and other measurement professionals: When a professional surveyor completes a project, the most valuable deliverable is his or her confidence in the work and the ability to quantify the accuracy of the results. While that statement may seem obvious to surveyors and other geospatial professionals, many people who use surveyors’ services don’t understand the basic concepts that lie behind high-quality geospatial information. Nor should they need to. The geospatial profes- sional draws from a unique set of skills and tools that enables them to stand behind their work with confidence. These capabilities set professionals apart from the general public. Their clients are paying for accurate, reliable results backed by professional judgment. Deliverables produced by geospatial professionals must be able to withstand detailed scrutiny, including examination by people whose interests may be in conflict with those of the client. Visualization reveals a common error of using an incorrect point ID for a backsight. Technicians can correct the error while preserving integrity of the original measurements. Like many professionals, surveyors provide their clients with expert opinions and complex deliverables. But results may be grasped in different ways. For example, while it’s common to accept without question a dentist’s assessment to repair a damaged tooth, surveyors are often challenged to explain or support their work. While it may be fair to question some aspects of survey analysis—property surveys come to mind—the data used to develop the surveyor’s conclusions must withstand any challenge. Surveyors are accustomed to this, of course. They have adopted practices that promote the accuracy and integrity of their data and resulting decisions. Commonly accepted best practices for survey quality contain rigorous techniques for redundancy, independent checks, traceability, and comparison to previous results. These practices are built around professional-grade software [an example is Trimble Business Center (TBC)] that enables the surveyor to manage, merge, and analyze the multiple types of information that go into a modern survey. One of the surveyor’s most important skills is the ability to use different technologies to obtain redundant data on a measured point. As technological advances in the surveyor’s field instruments and procedures produce more sophisticated data, the tools and techniques for quality analysis also evolve. Field software guides users through data acquisition and traps or prevents many problems while you’re still in the field. Although it’s not possible to prevent every error on site, office software enables surveyors to catch and correct issues early in the process. For example, common field errors such as incorrect target heights can be quickly corrected before they can affect terrain models or designs. Data management and analysis have moved far beyond the labor-intensive “connect the dots” drafting that was common in the early days of field-to-finish. In many cases today, the person collecting data in the field is not the one who handles the processing and analysis. That task is often handled by more-experienced personnel in the office who analyze the information and prepare and certify the deliverables. it’s not possible to certify that results are accurate and to comply with accepted standards. The key to the task is office software that is tightly integrated with field technologies and processes. to use different technologies to obtain redundant data on a measured point. He uses the quality analysis tools in TBC to merge and compare multiple observations to a feature, in- cluding measurements taken using different technologies (total stations, GNSS, imaging, etc.). In practice, a crew might measure the position of a feature of interest from two different total station setups and then add vertical data from a digital level. Using TBC, it’s a simple process to blend the total station measurements to produce XY coordinates and use the leveling data to provide a precise Z value. Hoaglin said his crews can combine GNSS measurements with optical data to provide an extra layer of quality control and confidence. Individual observations may be switched on and off to check for random errors, and computations are weighted based on the precision of individual observations. Within TBC, the computations become part of a point’s metadata and point derivation report, which provides a record of how the point was measured and computed. As sensor technology continues to evolve, the ability to collect data grows exponentially. Survey office software like TBC [which is the author’s specialty] supports positioning and image data coming from traditional survey tools such as GNSS, total stations, or levels as well as scanners, imaging sensors, and UAS. The software enables surveyors to analyze all the information in a single software package, thereby allowing surveyors to choose the best tool for the job. Many field surveys start in the office, where surveyors determine the best equipment to be used for a particular type of job and set standards for accuracy as well as CAD and modeling deliverables. The use of standard libraries and feature coding not only speeds up work in field and office but also serves as a great QA/QC tool by increasing the confidence in data collection. Formerly, field crews would capture points and descriptors, maintaining a field sketch of scene and then leave it to CAD technicians to connect the dots to produce a drawing or a topographic map. Scanning data clarifies inconsistent total station measurements. Note that some points are taken to the top of the fence while other fence points are along the ground. Today, field crews generate drawings in the field and get immediate visual feedback by using feature codes to handle linework, symbology, attributes, and terrain modeling. Points can automatically be assigned to layers and template standards set by the office personnel. These processes are some of the many ways that modern software uses graphical capabilities to increase productivity and flexibility. Graphical and spreadsheet views of post-processed GNSS vectors. Users can compare measurements to reveal errors or outliers. Visualization tools in office software have transformed many core surveying processes. In addition to scrutinizing tabular and spreadsheet reports, surveyors use graphics to analyze survey data. TBC can display vectors measured from a total station setup or RTK base to provide a quick visual inspection and the ability to review information and statistics on every measurement. Operators can quickly identify and correct any problems, including translating or rotating groups of measurements to remove blunders or systematic errors. Visualization for quality analysis extends to on-site georeferenced photography captured using cameras in data collectors, total stations, or scanners as well as point cloud data. Technicians can compare panoramic photos taken from each total station setup with measured points to confirm data integrity, get better context and understanding of the scene, and ensure that all data needed to complete the task has been obtained. In many cases, surveyors can use imagery and point clouds to resolve questions and eliminate the need for costly site re-visits. Hoaglin said that the ability to combine textual and numeric outputs with graphics provides additional flexibility in quality control. “We often use TBC to produce data spreadsheets,” he explained. “We can sort RTK vectors by residuals to look for outliers or suspect measurements. The inspection might reveal a number of vectors with high vertical residuals. “To gain context, we can select those vectors and drop them into Google Earth directly from TBC. It may be that the points lie in trees or other areas not conducive to RTK.” The information enables the Aztec teams to make decisions based on solid understanding of the field situation. As public awareness of geospatial information expands, accuracy and confidence are increasingly important. Consumer-grade GPS receivers, rangefinders, unmanned aerial systems (UAS), and freely available data sources such as Google Earth are enabling the public to easily capture and use geospatial data. This growth in consumer-grade geospatial technology will continue. While it represents a positive trend in public awareness of geospatial information, the growth carries the potential for confusion as unskilled users attempt to resolve complex issues in measurement and analysis— especially in property and land rights questions. Professional surveyors should emphasize their ability to handle these situations using training, processes, and tools that emphasize accuracy and rigorous documentation. They are uniquely qualified to provide authoritative information backed with a high degree of confidence in their performance and results. I’m glad that my son wants to grow up to be a surveyor. In the meantime, he has a lot to learn. 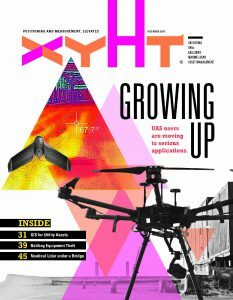 To read more articles from this print issue of xyHT magazine, click on the cover below.